The evidence has been put to Washington’s Nato allies and they have all backed the US case . 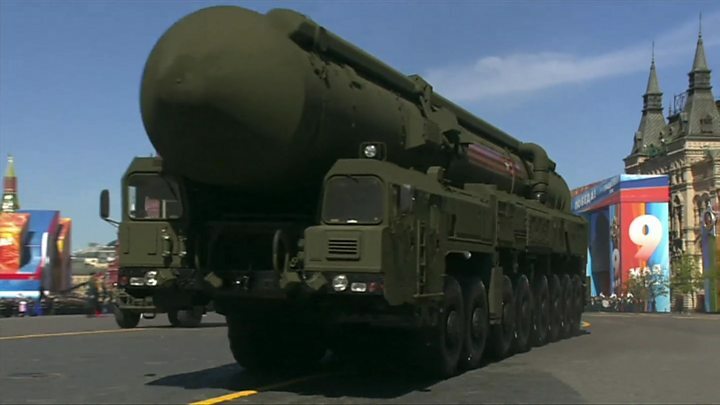 Besides denying breaking the INF treaty, Moscow says that US anti-ballistic missile interceptors being deployed in Eastern Europe could potentially violated the terms of the agreement. At Saturday’s meeting with his foreign and defence ministers, President Putin said work would begin on creating new weapons. These, he said, included a land-based version of Russia’s sea-launched Kalibr cruise missile, and new hypersonic weapons which can travel more than five times the speed of sound. “These new missiles are mobile, hard to detect, nuclear capable, can reach European cities and they have hardly any warning time at all so they reduce the threshold for any potential use of nuclear weapons in a conflict,” Nato’s Jens Stoltenberg told the BBC.